The giveaway is now closed. Congratulations to Carlene for winning the suede artist's pouch! 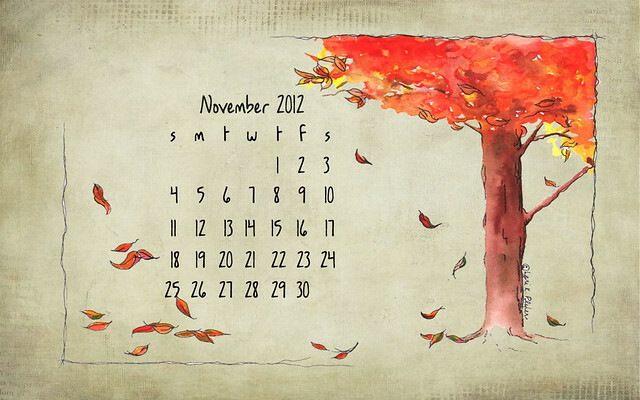 Be sure to read on and download the November desktop calendar as my gift to you. Have a great day! Heartfelt thanks to those who provided sage advice, helpful suggestions, and truly kind words on Monday. In all honesty, I often question the direction and decisions about what I write, my regular features, and design. I truly didn't expect such sweet support and, as you might suppose, hesitated and took a deep breath before hitting the publish button. You've renewed my spirit and inspiration and I thank you. As for the giveaway, it ends tonight at midnight (after the ghouls and goblins haven gone to bed) and I'll announce the winner at the top of this post tomorrow morning. So, come right back to the same post tomorrow to see who won - even if you've already visited and downloaded your November desktop calendar. Tootles, thank you, and Happy November! Oh, dear, I have been wrapped up in my own little bubble. I love your blog. I read it all of the time as a matter of course. I look forward to your posts. I forgot totally to give you any sort of feed back. Mostly, because I love what you do exactly the way you do it. I'm just really bad at commenting. Which makes me remember that I have not gotten back to you with feedback of any sort about the lovely leather bag you made. It arrived just in time for me to head off on a trip to Dallas. Perfect. Held every thing I needed. The old hand bag has been abandoned. I can not imagine using any other. Oh, stars, I do hope it never wears out!